Denver, CO – As of November 15th, city-wide sweeps targeting people without housing in Denver have intensified again, under explicit direction from Mayor Hancock. Citing the “Urban Camping Ban“, put into effect by Denver city council in April of 2012, Denver Police officers and Public Works have been forcibly moving people along, confiscating property and survival gear without due process of law, and giving out tickets and written warnings to people on the streets. According to the camping ban, it is illegal for anyone to sleep or rest on public or private property with anything underneath or over them except the clothing on their bodies. 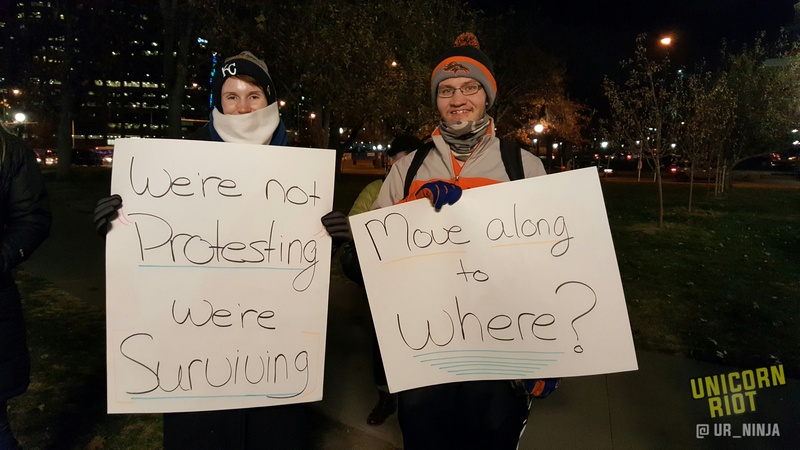 Our video below shows the response of the people without housing in Denver who are expressing their frustration of being forced to move from one place to another. A group of about 30 people who have been living for a few months on the public sidewalk outside the Samaritan House, a homeless shelter, have been strong advocates for the repeal of the camping ban and for truly affordable housing. Instead of staying out of the public’s eye, which the city appears to prefer based on their enforcement of inhumane laws, this group and others have remained in the open, finding safety and comfort in staying together as a community. Mayor Hancock is defending the sweeps despite a current class action lawsuit against the city for previous sweeps. “What this lawsuit is, is telling the city, stop. Respect the constitutional right to treat these people with dignity. Stop swapping their dignity in for your chance to make a buck. Which is all this is about” said the group’s attorney, Jason Flores-Williams. 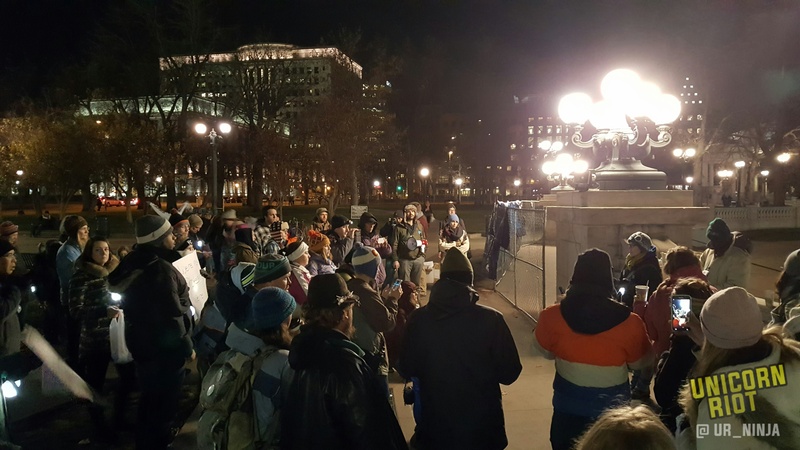 On December 2nd, 2016, Unicorn Riot was live to cover The Parade of Rights, an event called for by an individual within the online community We Demand An End to Denver’s Urban Camping Ban @SweepsKill. Terese Howard of Denver Homeless Out Loud was able to outline for us the increased sweeps in Denver as the weather consistently drops below freezing every night. People dispersed into the Parade of Lights holding signs, with small camp lights attached to their backpacks and some carrying a tent above their heads. The temperatures tonight are in the 20’s. Last year, 141 people died in the streets without shelter. Each one of these deaths were the result of Homelessness! This has to end! Help us in our struggle to end the deaths of people experiencing homelessness by standing in solidarity with us. Wear this tent symbol (made by a houseless person) until the Urban Camping Ban is lifted. Educate your peers at work, school or house of worship. Join us on the streets to witness the sweeps and to film this travesty of justice. Help us Pass the Right to Rest Bill. Join us at the Capitol this session. Donate tents, gloves, warm winter gear to Denver Homeless Outloud. Make a contribution. 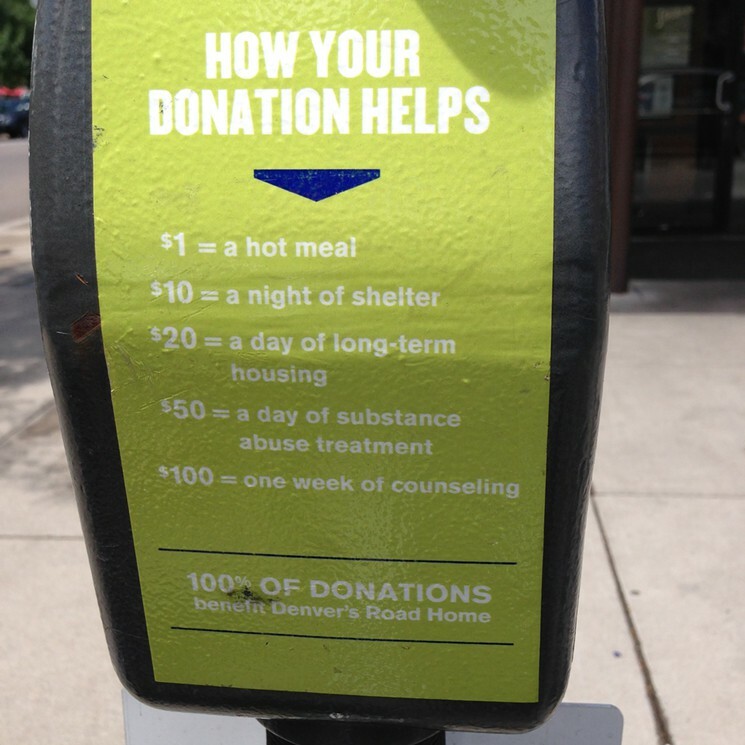 EVERY DOLLAR will be used to provide direct service to people in critical need. Tonight we walk in this parade in solidarity with our brothers and sisters experiencing homelessness; to tell Mayor Michael Hancock and the City Council we DEMAND AN END TO THE URBAN CAMPING BAN. There are over 10,000 people experience homelessness on any given day in Denver, yet the decisions Mayor Hancock makes directly lead to deaths on the street. They are part of our community. Let’s imagine a city where all of our neighbors, rich and poor, have a place to belong. Unicorn Riot will continue coverage on the current targeting of Denver’s unhoused population and will provide updates as they become available.